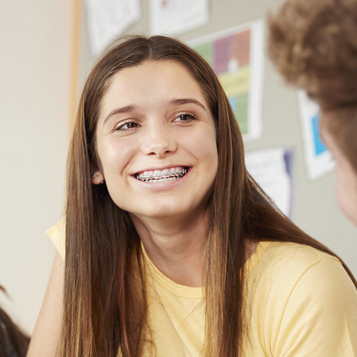 If the length of time in braces is holding you back from treatment, Wilckodontics may be for you. Using a combination of oral surgery and traditional orthodontics, you can get the beautiful, straight smile you’ve always wanted sooner than you ever thought possible. Teeth can be moved approximately four times faster, meaning a total treatment time of three to eight months! Wilckodontics, also known as Accelerated Osteogenic Orthodontics (AOO)™, begins with a minimally invasive surgical procedure, usually done under general anesthesia, to remove a small portion of your aveolar bone’s external surface. This is the bone that contains your tooth sockets. For a short period of time, the bone’s mineral content will be decreased, allowing your braces to quickly move your teeth into their desired positions. Your aveolar bone will heal quickly and actually become stronger than it was before the procedure. Quite simply- yes! The process used to demineralate bone has been used for the past 100 years in the orthopedic field and has recently been modified to help straighten teeth. Of course, undergoing any kind of surgery no matter how noninvasive has risks, so be sure to discuss these risks with your doctor. Is Wilckodontics right for me? AOO can be done on people of any age as long as all your permanent teeth are present and you have a healthy bone structure. To learn more about Wilckodontics and to find out if you’re a candidate for AOO, please contact our office. We look forward to answering any questions you may have and helping you get the beautiful, straight smile you deserve. Learn more about Wilckodontics on their web site at www.wilckodontics.com.